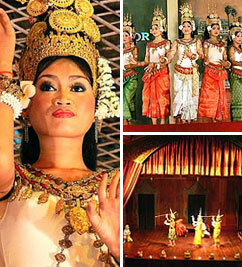 The Apsara Dance Show and the Shadow Puppet show are the only few surviving performance arts of Cambodia. This thousand year old art was nearly erased during the civil war however, a few dance masters survived and thus they were able to pass down the heritage and tradition to the new generation. 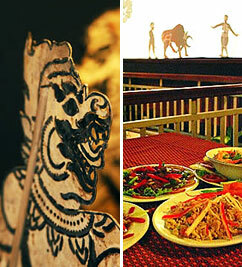 Enjoy the traditional performance art from Cambodia and savor a sumptuous Cambodian set meal to go with it. Avail of this tour plan [M-08] for only USD 7 per person upon application of the KRORMA BUS DAY TOUR. Q.for the [M-08A] tour package, are we able to choose our own specific restaurant? Unfortunately we are not able to arrange for this request as we have 10 designated outlets for the Dinner show and locations will vary depending on the seat availability. •	We will not be held responsible for any time delays or any accidents incurred within this tour course. •	Kindly note that fees may vary during holiday periods and on peak seasons. •	Time schedules may vary depending travel season.